Our arrival in Mataranka was timely as our provisions had run right down and we were badly in need of new supplies. Our first stop was the local store and the prices reflected the isolation of the town. We had decided on staying in a caravan park and we definitely needed one the first night as were both longing for a nice shower, bathing in a bucket of water in the caravan is only good for so long. 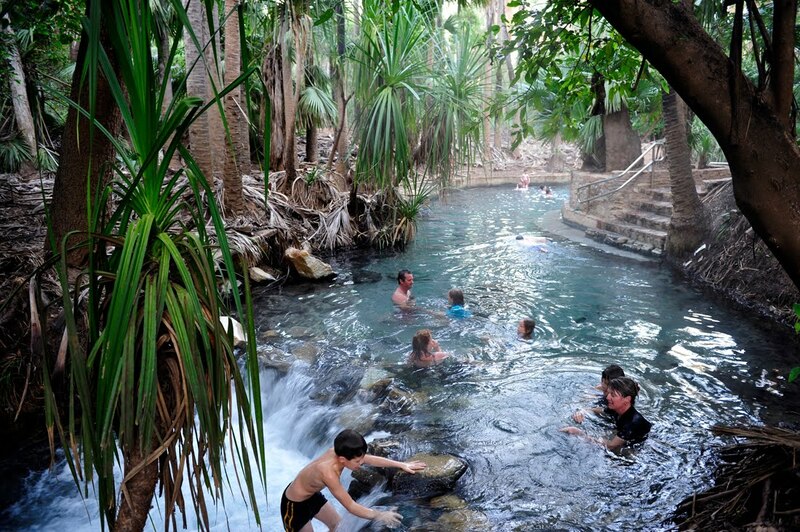 We selected the Homestead at Mataranka Springs and booked in there. My first action was to soak it up in the thermal Rainbow Pool and although it was slightly warm, it was not hot. Although the pool was a definite plus the caravan park turned out to be a bad choice. There were four bus loads of high school students camping there for two days and the caravan park was full. The students soon found that the laundry was a great meeting place and the laundry was right opposite our van. The septic system could not handle the load and raw sewerage was running down the roads in the park. We stayed two days and then moved into another park in Mataranka for a night. The highlight of Mataranka for me was finding and photographing the rare and endangered Red Goshawk. The second caravan Park Manager told me where it was nesting and I managed to find both the birds and the nest. 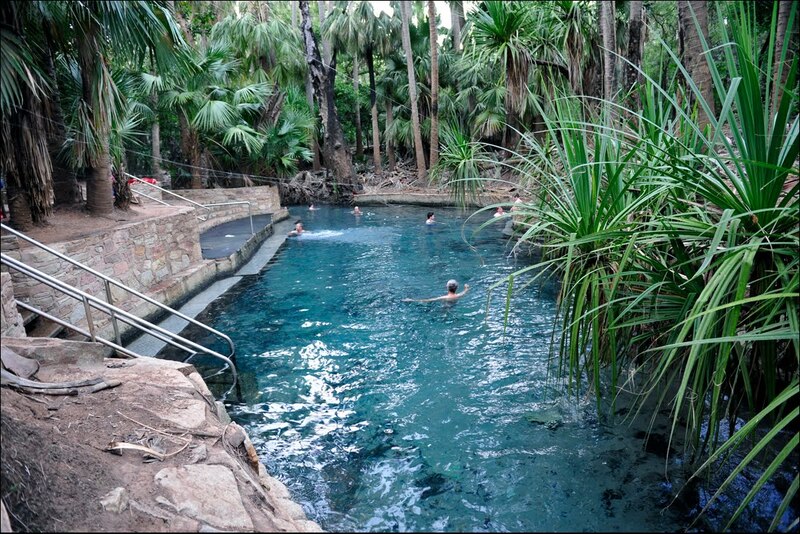 The other thing Mataranka is known for is its Thermal Pools. 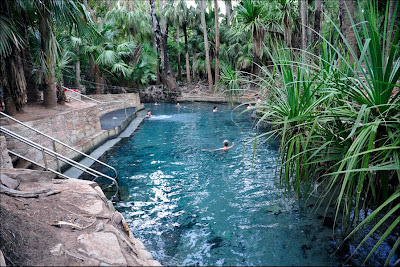 There are two main pools, Rainbow Pool at Mataranka Homestead and the spring and pool at Bitter Springs. There are several others in the area but these are the two main tourist pools. 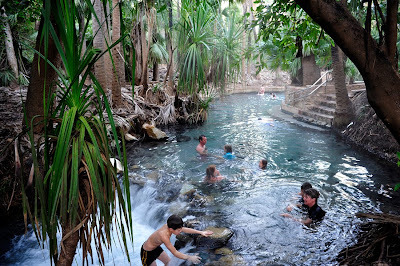 At Bitter springs, people float down the narrow creek in a slow drift with the flow of water from the spring. The creek is deep and I could not touch the bottom although there are some logs to stand on at times. It was 105 kilometres from Mataranka to Katherine and this took us around one and a half hours with a stop for coffee. Katherine is the home of the famous Katherine Gorge which is a money making machine for the NT Government from the tourist industry. I have done the gorge trip several times before and walked the track along the top of the gorge and also the five day Jatbula Trail, a 58 kilometre walk from Katherine Gorge to Edith Falls along the escarpment. This is a great ,easy and beautiful walk with campsite at waterfalls or pools each night and plenty of time for swimming after you arrive. So for us, Katherine was a place for more supplies, gas, fuel, a new phone and some bird photography. We went to the gorge and I managed to get some great photos. These are also on my Flickr Site. Tomorrow, (Saturday 3 /7/2010), we head to Edith Falls, a short drive to another beautiful area.